Written by members of the development team that maintains Subversion, this is the official guide and reference manual for the popular open source revision control technology. 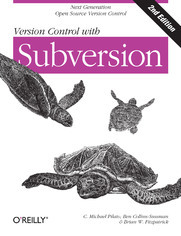 The new edition covers Subversion 1.5 with a complete introduction and guided tour of its capabilities, along with best practice recommendations. Version Control with Subversion is useful for people from a wide variety of backgrounds, from those with no previous version control experience to experienced system administrators. Subversion is the perfect tool to track individual changes when several people collaborate on documentation or, particularly, software development projects. As a more powerful and flexible successor to the CVS revision control system, Subversion makes life so much simpler, allowing each team member to work separately and then merge source code changes into a single repository that keeps a record of each separate version. If you've never used version control, you'll find everything you need to get started. And if you're a seasoned CVS pro, this book will help you make a painless leap into Subversion.